Indus Motors held its 19th Annual Dealer conference with the theme,”Leading Together”, which was attended by Managing Officer of Toyota Motor Corporation as well as the senior management from House of Habib. Speaking on the occasion, Managing Officer, TMC, Mr. Hiroji Onishi requested IMC and its dealerships to keep in mind the philosophy of ‘Customer First’, he also said that Pakistan has enormous potential for future growth and it is one of the most promising markets for Toyota. Perhaps the future growth only refers to Corolla. Much like any other dukandaar from any random shopping street in Pakistan, Indus Motor also reiterated that they have achieved what others could only dream of, they have the best product, quality, people and so on so forth. 52,000 units sold in 2009-10 is a feat in itself, or is it? Lets not forget that IMC is selling in a country where people are stuck with only handful of choices and when Imports are also labeled as punitive, I don’t think that’s an achievement then? Try to achieve those numbers in a competitive market environment then you’ll know where you really stand. CEO, Indus Motors, Pervez Ghias, spoke in the festival(Party to celebrate the record sales) that Indus Motors has achieved best ever quality result of SQA(Final product going to be delivered), yes Mr. Ghias, I agree, so what, if few new Corollas(here & here) broke their axles the moment they stepped on the road? or the AirCon makes some weird noise on 2.5K RPM? or the Altis Range meter show 1 KM range with quarter tank of fuel? 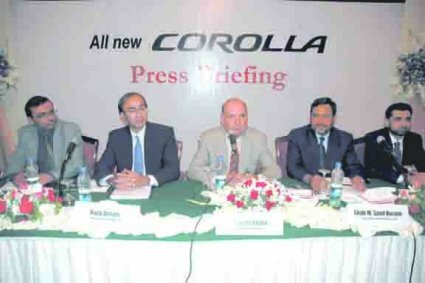 or there are 17 pages of problems about the new Corolla on PakWheels.com? So what if quantity has taken over quality? What matters is that Indus Motors sold 52,000 record units, and the numbers speak for IMC. Awards were also distributed amongst the dealers(Nationwide) for three categories, Toyota Faisalabad Motors won the Nationwide Sales Award where as Toyota Central Motors won two awards for Service, Parts, Customer Relations and the overall Nationwide Best Performance Awards.